Robert H. Gibbs is a founding partner of Gibbs Houston Pauw. He has practiced immigration law since 1977, handling a wide variety of employment, family, citizenship, asylum and deportation cases. His practice includes federal court litigation to remedy agency decisions or inactions, as well as class actions to obtain relief for thousands of individuals. He has represented entities in a broad range of industries including software, health care, restaurants, manufacturing, agriculture, food processing, forest products, international trade, professional services, construction, sports and the arts. Mr. Gibbs has a top rating (AV) from the leading national lawyers’ directory, Martindale-Hubbell. Chambers USA and Who’s Who Legal 2012 give him the ranking as a leading lawyer in business immigration. He is annually ranked a Washington State “Super Lawyer” in immigration practice by Law & Politics Magazine. 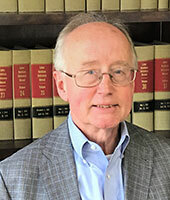 Mr. Gibbs is a frequent lecturer at seminars for attorneys and employers on immigration law and workplace compliance, federal court litigation, and naturalization. Gibbs, “It Ain’t Over ‘Til It’s Over: Amnesty Issues Persist a Decade After IRCA”, Interpreter Releases vol. 73, no. 41 (Oct. 28, 1996).